Let's turn back the clock about nine days. I just got back from Chicago two Friday's ago. That evening, I was about to leave the house to pick up some take out we'd ordered. While getting my stuff together (shoes, wallet, keys, etc) and glancing at the TV, I saw Sheffield step up to the plate at Citi Field. Gary Sheffield is amazing, and I had a feeling. I was about to turn off the TV since the food should have been ready by then, when I though "maybe". I had a feeling Sheffield would join the 500 home run club then and there. It was a long at bat. He fouled off a pitch that he hammered down the left field line. After what seemed like ten minutes, as I was trying to avoid the distraction of my responsibility, Gary Sheffield got a pitch up and tomahawked it out and over the left field wall. 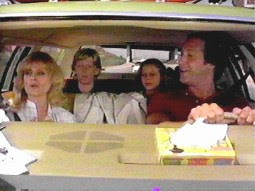 I often joke in a Clark Griswold sort of way that live sports are "living history". I'll say that about any live sporting event in which I'm mildly interested. In the case of someone joining the 500 home run club, it at least used to be historical. One of the shameful repercussions of the Cream & Clear era is how milestones like this are cheapened. I like Gary Sheffield, but I don't really hope he makes the Hall of Fame. My feeling is that if he were to get in the Hall, it could grease the wheels for that scumbag liar, Barry Bonds, to get in. Remember, Barry Bonds allegedly recommended and supplied "The Cream" to Sheffield during the offseason they worked out together. Wouldn't it be something if Bonds got into the Hall after voters' opinions started lightening up because a "borderline" guy like Sheffield got in? Bonds would be getting rewarded indirectly for being a pusherman. Regardless of what Gary Sheffield did or did not put in or on his body, he will always be one of the most fearsome right-handed hitters in my lifetime. Manny Ramirez is probably the best. Who else? Albert Belle? Rickey Henderson? Frank Thomas, in his first few years, for sure. Bo Jackson? No, Bo struck out way too much. Joakim Soria. Coming back on Monday? Who's their closer, if needed? Juan Cruz would be our pick. I'd LOVE to see Farnsworth get the first chance, if only to read Joe Posnanski's thoughts afterwards. Gordon Beckham. This guy is either the next Ty Griffin, or he's going to be a very good Major Leaguer. I think he's better than Ty Griffin was twenty years ago, but Ty's minor league career OBP of .366 makes me wonder how he never played a game above Double A. Looking at Beckham's Baseball Cube page, I see their scouting report (on a scale to 100) has Power: 97, Contact: 75, and Patience: 81. That's pretty solid for a 22 year old. Impatient White Sox fans want to see Beckham playing on the South Side right now, and I can certainly understand why. The more important thing for them is that when he comes up, he comes up to stay. Speaking of the White Sox, their radio broadcast team of Ed Farmer and Darren Jackson brought up an interesting point a couple of weeks ago, in regards to Jermaine Dye and Paul Konerko. I can't remember who actually brought it up, maybe Farmer. The sentiment was basically about how great it is that two teammates, who are such great friends, of similar ages, and with similar career numbers, can push each other to keep succeeding. I actually think that is a great point. I think when Paulie sees Dye have success, and vice-versa, he'll have a greater sense of confidence that he can do well, too. If those two guys can stay productive and healthy the White Sox will be near the top of their division. 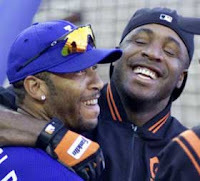 Can we spark up a discussion on other teammates, age 33+, who have gone through a bromance like Jermaine and Paulie? Did their success carry the team? Did one of them get hurt, then the other fell apart? One of the take aways from this is that it is good to live in a city with two baseball teams. I mean, I hate the White Sox, but it's better than listening to the the neanderthals on other sports talk stations. The Oakland A's and Detroit Tigers are a couple of teams that I find intriguing. Both teams have well respected General Managers and are in "winnable" divisions. I also think that these two teams' volatility have them on a fence between winning over 85 games or losing over 85 games. The A's are "getting better". They had an offseason of supposed improvement, adding Matt Holliday, Jason Giambi, Orlando Cabrera, Nomar Garciaparra, Michael Wuertz, and more is supposed to turn 2008's JV team into a 2009 contender. However, in the first three weeks of the season, they have not played well. I must mention the contributions of Jack Cust. He was on the Portland Beavers the entire season I was with the club, 2006. That year, he clubbed 30 HR's and walked what I believe to have been a record 143 times. His slash numbers for the Beavers that season were .293/.467/.549. I have something to say about Jack Cust that should be in its own post. He seemed like a very nice guy, and I root for him. He's been on our roto team basically his entire time with the Oakland A's. He is maybe the best example of the three non-BABIP outcomes per plate appearance, for his propensity to hit HR's, Walk, and Strike out. Back to Detroit... The Tigers, in contrast to the A's, are supposedly on the way down. They were in the World Series in 2006 (David Eckstein MVP? Ugh.) They are getting older, and their window is closing. Dontrelle Willis turned into the worst pitcher since Rick Ankiel. Gary Sheffield is on the Mets. Justin Verlander's peripheral stats suggest that he's pitching more like he did in '06 and '07, than last season. Fernando Rodney, for the most part, has looked like the guy who would be the closer for the Dominican National team. A couple of rookies are quickly getting reputations for having power arms and being ahead of the game: Ryan Perry and our darling Rick Porcello have impressed in their first few appearances. Perry has been clocked towards 100 mph, and he's getting a reputation as a bit of a head hunter. That never hurts. 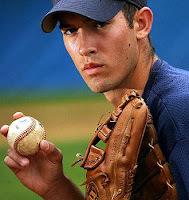 Porcello is one of those guys I am rooting for to have a Lincecum-esque jump to the head of a rotation. I've been wanting to write about Carlos Pena for a few days, but I haven't much to say. I think he's also one of those HR, BB, K guys, but he looks like he is ready to have a big year. It's all about health with him, but a fast start certainly helps when you have a chance to have a career season.